Kolli Hills is a major mountain range and is an outliner of the Eastern Ghats. It is eighteen miles(28 Kilometeres)long (north south) twelve miles(19 Kilometers) wide(east/west). Kolli Hills could be reached through a ghat road which was 70 hairpins bends. The village at the foot hill is Karavalli. 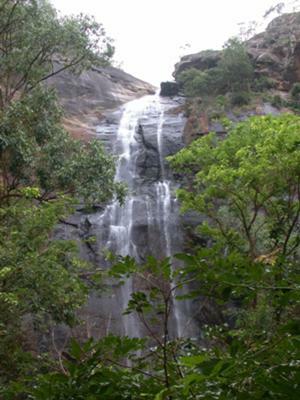 Kolli Hills is 80 KM from Trichinapalli, Tamil Nadu. The distance from Namakkal to Kolli Hills is 55 KMs.. The ghat road alone 26 KMs. The district administration is taking steps to form an another ghat road called Nariankadu-Mullukurichi road which, when formed will have only 2-3 hairpin bends. Akasa Gangai is an enchanting 300 feet waterfall of river Aiyaru, located near Arappaleeshwarar temple. Thousands of steps lead down to the falls. It is situated in a beautiful valley surrounded by the mountains at all sides. Enroute, the natural beauty of the valley and the vegetation-covered peaks . The location is ideal for trekking and the breeze is pleasant, the cascade of silvery water touching and brushing the innumerable herbs which are abound in Kollihills keeps everyone spell bound and fresh with its herbal qualities. I came to know about this wonderful waterfalls only recently. I am planning to visit the AGASA GANGAI during this summer.